Bring your old case lighter roaring into the 21st Century in just 2 easy steps - Remove the original lighter insert and replace with the Z-PLUS insert and you're ready to go. Keep your favorite Zippo style lighter while adding the modern convenience and reliability of a powerful blue torch flame. 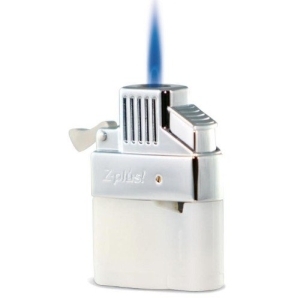 The Z-Plus Torch Flame Lighter Insert features: Electro Quartz Crystal Ignition, never need another flint, Butane Refillable, No Odor, No Mess, and it won't evaporate, Wind resistant torch flame makes it ideal for outdoor use.